—The first presentation of Georgia O’Keeffe’s depictions of Hawai‘i in New York City since their 1940 debut, Georgia O’Keeffe: Visions of Hawai‘i focuses on the iconic artist’s immersion in the Hawaiian Islands in 1939. The New York Botanical Garden’s exhibition is on view from May 19 through October 28, 2018. Visitors will experience a lush flower show in the Garden’s Enid A. Haupt Conservatory evoking the gardens and landscapes that inspired O’Keeffe as well as the complex story of the flora and unique ecology of Hawai‘i. Curated by art historian Theresa Papanikolas, Ph.D., Deputy Director of Art and Programs and Curator of European and American Art at the Honolulu Museum of Art, the exhibition features 20 of O’Keeffe’s depictions of Hawai‘i—including paintings not seen together since their 1940 New York debut. Visitors of all ages will learn about Hawai‘i through complementary events and programs, including a scholarly symposium, an original short film, a film series, and the Interactive Mobile Guide. In 1939, at the age of 51, O’Keeffe traveled on commission to Hawai‘i to produce images for a Hawaiian Pineapple Company promotional campaign. Her nine weeks on O‘ahu, Maui, Kaua‘i, and the Big Island of Hawai‘i resulted in stunning depictions of mountains and waterfalls as well as her signature close-cropped views of flowers and plants she observed. 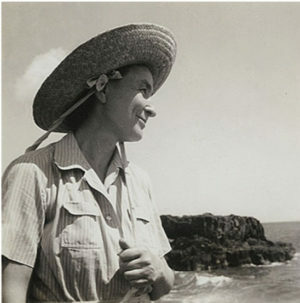 At the time of her trip, O’Keeffe was among the most famous artists in the United States, best known for her depictions of the stark landscape and desert flora of her beloved New Mexico.Georgia O’Keeffe: Visions of Hawai‘i, will explore this lesser-known chapter in her career, the enduring cultural impact of mid-century perceptions of Hawai‘i, and the natural history of the Hawaiian Islands—one of the most ecologically diverse places on Earth—hidden behind O’Keeffe’s depictions. Integrating art, horticulture, and historical interpretation, the exhibition will explore the Hawai‘i that O’Keeffe experienced and also reveal the complex history of the Hawaiian Islands that she was not familiar with at the time. The Enid A. Haupt Conservatory showcases the remarkable beauty and richness of Hawai‘i’s wild and cultivated flora. Featuring plantings designed by Francisca Coelho and set pieces designed by Tony Award-winning scenic designer Scott Pask, the exhibition also introduces visitors to the profound importance of plants in Hawaiian culture and growing concerns about threats to native Hawaiian plants. Long borders of colorful tropical garden plants such as those Georgia O’Keeffe encountered and painted while in Hawai‘i include ti plant, frangipani, bougainvillea, heliconia, hibiscus, bird-of-paradise, ginger, and many more tropical favorites. Beyond the borders, planting beds arranged around an open-sided, thatched-roof pavilion inspired by a traditional Hawaiian hale tell the story of canoe plants—useful plants brought to the Islands more than 1,000 years ago by Polynesian settlers. Vignettes featuring native Hawaiian plants will teach visitors about modern efforts to preserve Hawai‘i’s imperiled flora. Francisca Coelho’s plant list contains more than 300 types of plants for the exhibition. Outside in the Conservatory Courtyards starting in June, visitors will see a wide variety of Hawaiian plants in beautiful potted and ground-level trough displays. Pineapples and bananas, among other favorites, will be on view in the Central Courtyard, while hundreds of hibiscus, as well as gardenia and bougainvillea, will fill the Hardy Courtyard. Canoe plants and other edible and useful tropicals such as papaya and sugarcane will be on display the Tropical Courtyard. A Poetry Tour, organized in partnership with the Poetry Society of America, explores the relationship between nature and people in the Hawaiian Islands. The Tour highlights the work of contemporary poets in Hawai‘i, including former U.S. Poet Laureate W.S. Merwin. Stieglitz (1864–1946). The exhibition spotlights a transformative experience in the legendary artist’s life, revealing O’Keeffe’s deeply felt impressions and the enduring influence of the Islands’ rugged topography, dramatic landscapes, and exotic plants. The works in this grouping, not seen together in New York since their 1940 debut, were all created in 1939 and include Heliconia, Crab’s Claw Ginger [plant depicted is actually a “lobster claw” heliconia] and Pineapple Bud (both of which were used in the Hawaiian Pineapple Company’s advertisements and which are held today in private collections);Hibiscus with Plumeria (loaned by the Smithsonian American Art Museum); and a series of landscape paintings depicting Maui’s interior ‘Īao Valley and lava-studded shorelines (loaned by the Honolulu Museum of Art, the Memphis Brooks Museum of Art, and a private collector). In the Britton Rotunda, an original short film entitled Off in the Far Away Somewhere: Georgia O’Keeffe’s Letters from Hawai‘i—narrated by Academy Award-nominee and NYBG Trustee Sigourney Weaver—features excerpts from O’Keeffe’s personal letters to her husband, famed photographer Alfred Stieglitz, written during her journey to and around the Hawaiian Islands. The Britton Gallery features Flora Hawaiiensis: Plants of Hawai‘i, tracing the history of Hawai‘i’s flora, from unusual native plants, to those valued by the ancient Hawaiians, to the ornamental and agricultural plants O’Keeffe painted. Displays showcase archival photos, illustrations, and letters from the LuEsther T. Mertz Library and specimens from the William and Lynda Steere Herbarium. The exhibit also highlights the work of current and former NYBG botanists in the Pacific Islands, including Collaborators in Hawaiian Botany, Drs. Otto and Isa Degener, who explored and documented the flora of Hawai‘i in their magnum opus,Flora Hawaiiensis (1932–80), and worked to conserve its ecology. In the Ross Gallery, enjoy Georgia O’Keeffe’s Hawaiian Voyage, a display highlighting the artist’s journey from her departure at New York’s Grand Central Terminal through her nine- week island-hopping explorations of exotic flora and lush landscapes. Hawaiian-inspired food will be available for purchase in the Hudson Garden Grill and at STARR Events’ new Poke Truck, which will feature four different types of poke (including a Veggie Bowl), the trendy dish of marinated raw fish served over rice with Asian seasonings. A rich program of performances, events, and activities throughout the Garden, for adults and children, celebrates the diverse cultural traditions of Hawai‘i past and present, as well as the beauty and variety of Hawai‘i’s flora. During Aloha Nights, evening programs will spotlight the culture that captured Georgia O’Keeffe’s imagination. On select Celebrate Hawai‘i Weekends, NYBG, in collaboration with Hawai‘i Tourism United States, will feature performers, artists, and artisans from Hawai‘i, showcasing the time-honored traditions and unique cultural heritage of the Islands. A scholarly symposium and a film series are also among the planned programming. A visually stunning Interactive Mobile Guide, available at nybg.org/mobile, complements the exhibition by transporting users to both the current Hawaiian landscape and back in time to the Hawai‘i that O’Keeffe visited in 1939. Features include multiple 360-degree videos of the plants and locations O’Keeffe observed and depicted in her work; personal accounts found in O’Keeffe’s handwritten letters; advanced location-aware technology that will help users engage with content automatically; and vintage photo frames that allow participants to create their own digital souvenirs and share on social media. The fully illustrated exhibition catalog explores this little-known chapter in the artist’s career. Glowing with color, O’Keeffe’s Hawai‘i pictures demonstrate her unique ability to make every place she painted her own. In addition to essays discussing O’Keeffe’s depictions of Hawai‘i and their significance in her oeuvre as a whole, this landmark volume offers a unique perspective by foregrounding the complexity of the Hawaiian Islands—one of the most ecologically diverse places on Earth—alongside her works of art. Available for purchase at NYBG Shop and at nybgpress.org. throughout her career, and these iconic images are celebrated for their bold use of color, form, and scale. This engagement with a new place—and use of her familiar compositional techniques—shows continuity with the rest of her large body of work. O’Keeffe’s time in Hawai‘i, and the work that was produced there, is less well known than her iconic New Mexico scenes, and it is not a place with which she is often associated. However, close study of the work and her correspondence during her trip reveals a deep appreciation for the beauty of the Islands and a fascination with the landscape she encountered. O’Keeffe’s visit to Hawai‘i coincided with increasing awareness of the remote U.S. territory in the American consciousness as tourism boomed and Hawai‘i approached statehood. While O’Keeffe’s correspondence from this period reflects the perspective of a visitor who was steeped in popular perceptions of the Islands as an idealized tropical paradise, her paintings masterfully depict the Islands’ unique natural settings and serve as a compelling starting point to examine the transformation of the Hawaiian landscape through human and cultural influences. About Curator Theresa Papanikolas, Ph.D.
Theresa Papanikolas, Ph.D., is Deputy Director of Art and Programs and Curator of European and American Art at the Honolulu Museum of Art, where she oversees the museum’s curatorial department, educational programs, Art School, library, installations team, Visitor Information Center, and permanent collection. Since coming to the museum in 2008, she has led an innovative reinstallation of its holdings in European and American art and organized the exhibitions From Whistler to Warhol: Modernism on Paper (2010), Georgia O’Keeffe and Ansel Adams: The Hawai‘i Pictures (2013), Art Deco Hawai‘i (2014), and Abstract Expressionism: Looking East from the Far West (2017), and she has helped position the museum as the cultural hub of one of the country’s most diverse metropolitan areas. From 2006 to 2008, Dr. Papanikolas was Wallis Annenberg Curatorial Fellow at the Los Angeles County Museum of Art, where she organized Doctrinal Nourishment: Art and Anarchism in the Time of James Ensor (2008) and helped plan Drawing Surrealism (2012). She has also held positions at Rice University, the Museum of Fine Arts, Houston, and Contemporary Arts Museum Houston. She has an expertise in 19th- and 20th-century art, and has published widely on Dada and Surrealism. She holds degrees in Art History from University of the Southern California (BA) and the University of Delaware (MA, Ph.D.), and has completed a Fellowship at the Center for Curatorial Leadership (2016). Georgia O’Keeffe: Visions of Hawai‘i is The New York Botanical Garden’s current installation within the ambitious exhibition program it pioneered to explore the horticultural lives of cultural figures such as Frida Kahlo, Charles Darwin, Emily Dickinson, and Claude Monet and the intersection of art and nature. The exhibition catalog is supported by the Wyeth Foundation for American Art. Exhibitions in the Enid A. Haupt Conservatory are made possible by the Estate of Enid A. Haupt. Exhibitions in the Arthur and Janet Ross Gallery are made possible by support from the Arthur and Janet Ross Fund.